Manchester United are reportedly keen on West Ham youngster Declan Rice as he impressed in front of their watching scouts this weekend. 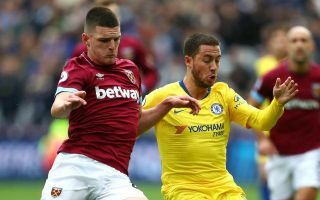 That’s according to a report from the Metro, who also note that Chelsea are after the highly-rated 19-year-old after he rejected the offer of a new contract with West Ham. Rice looks one of the top young defensive players in the Premier League right now, and impressed again this weekend despite his side’s 4-0 thrashing at the hands of Manchester City. The teenager played a holding midfield role in front of the back four, but is a versatile player and could also do a job for United in defence. The Red Devils are weak in both of those areas, so it’s little surprise they’ve reportedly had scouts keep an eye on Rice ahead of January. The Metro add that the Hammers are concerned about losing the Republic of Ireland international, and it certainly doesn’t look good for them as top clubs circle and his current contract expires at the end of the season. It remains to be seen if the player himself would choose United or Chelsea, but it seems Jose Mourinho wants his side to be firmly in the running for one of the best young players in the division.